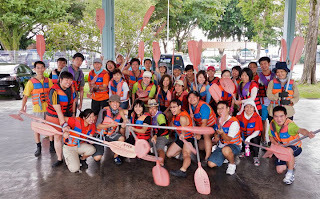 our kayaking orientation was held at Water Venture, Changi. noe and kayak, parts of the kayak, how to handle a kayak properly, etc. then we brought the kayaks and equiment to the beach, where we were taught how to properly wear a life vest, how to properly handle a paddle, and had a dry practice on using the paddle. in the water, we learnt how to get on and off properly, and what to do when we capsize. finally, we got into pairs and set off for a short-distance row before breaking for lunch. after lunch, i swopped from a double kayak with my buddy, to a single kayak, as i wanted to experience handling direction, power, and orientation on my own. as a group, we got into a diamond formation, and rowed across the sailing channel, took a brief break at the board walk, then rowed back. before we knew it, it was already time to pack up, so we did the proper boat washing, kept all the equipment, and left at 5pm. it was a rather enjoyable trip, getting to know how to properly handle a kayak, and i learnt quite a bit from the youth volunteer instructors. i may consider getting my "stars" for kayaking in the future, if time permits.